Card types are a very powerful mechanism in Mnemosyne. Let's look at the most common ones. The simplest card type is where Mnemosyne only quizzes you in one direction. E.g. in the example below, you will be asked to come up with the answer 'Paris'. If you also want to be quizzed in the other direction, change the card type to "Front-to-back and back-to-front". This will create a sister card of the first card. If you update the contents of the card, both sister cards will be automatically updated. Also, Mnemosyne will not schedule long-term reviews of sister cards on the same day, as that might lead to artificially easier recalls. A more sophisticated variant of the "Front-to-back and back-to-front" is the "Vocabulary" card type, which also includes fields for pronunciation (useful if the language you are learning is in a funky script) and additional notes (e.g. grammar info). Mnemosyne will create two sister cards for this: a so-called "Recognition" card, with the foreign word as question, and a so-called "Production" card with the meaning as question. For each card, the pronunciation and note info will be put on the answer side. To see what these cards look like, press the "Preview" button. 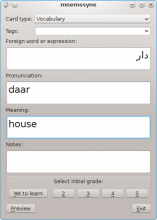 If the language you are learning uses latin script and you are not interested in the pronunciation field, right-click on a text entry field, and choose "Hide pronunciation field for this card type". What if you want to study more than 1 language, but want to use different formatting options for each language, like a different font for the foreign word, or a different background colour? 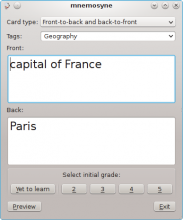 In the card type manager, create two clones from the Vocabulary card type, one for each language. Now you have two separate card types which you can format independently. Mnemosyne comes with a few plugins for different card types, like Cloze deletion (to selectively hide one or more words in a sentence), Map (specifically tailored to study blank and marked maps) or Sentence (a cross between Vocabulary and Cloze to help you study languages using sentences). Have a look at the plugin description for more info on how to use them.